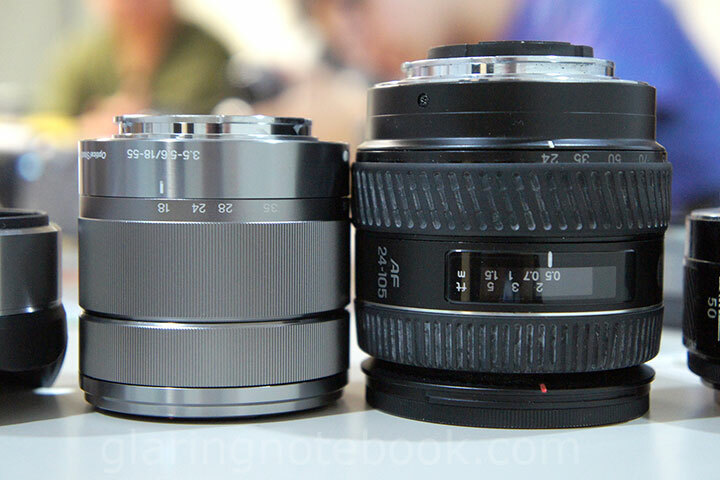 I managed to try the Sony Alpha NEX-3 and NEX-5 recently! Both are demo units but the functionality should be the same. Here we can see that the “Release without lens” option is back, so we can use unchipped lenses in Aperture Priority! YAY! 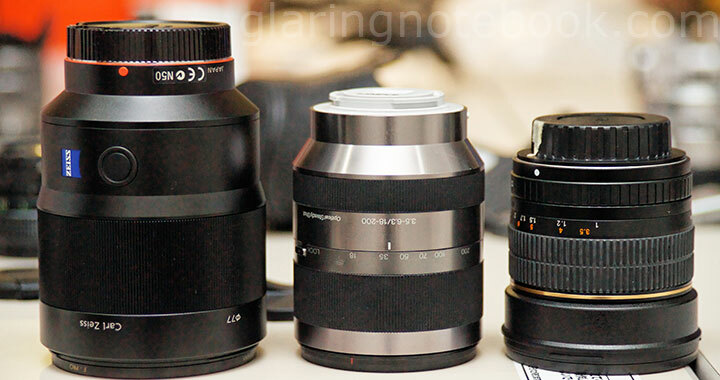 Left to right: Sony E 16mm F2.8 pancake lens; Sony VCL-ECF1 fisheye converter; Sony E 18-55mm F3.5-5.6 OSS lens; Minolta 24-105mm F3.5-4.5(D), Minolta 50mm F1.4 Original. This should give you an idea of the scale of the 18-55mm. Note that it has a metal mount, unlike the plastic mounts of the Sony 18-70mm F3.5-5.6 DT or the Sony 18-55mm F3.5-5.6 DT SAM. One step forward. The back of the Sony E 16mm F2.8 pancake lens. Also metal mount. 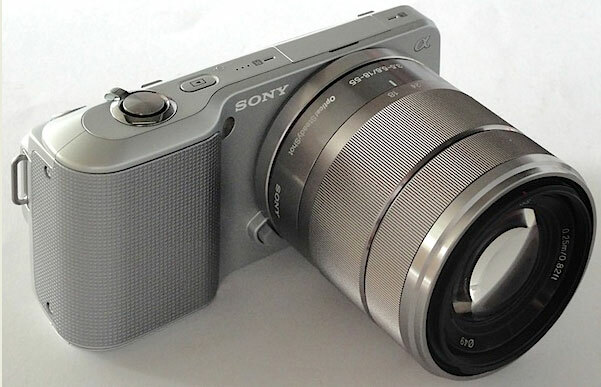 Sony E 18-55mm F3.5-5.6 OSS (Optical SteadyShot). This makes for quiet stabilization in video – you really don’t hear it stabilizing, or focusing! However when you turn the zoom ring you can still hear it rather obviously, especially when you hit the ends. 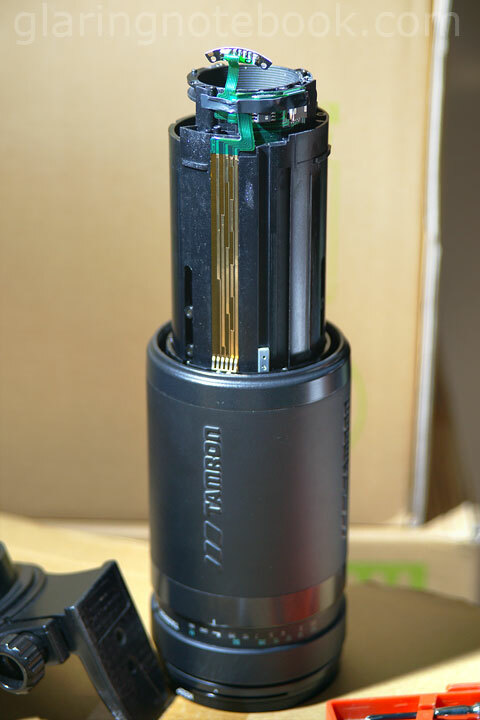 There is no sensor stabilization, which has been a strength of the Alpha series before this. I would have preferred to have sensor stabilization as well so we can use it for taking pictures (obviously, sensor stabilization can be heard while recording video, so it could be disabled then.) One step backward. 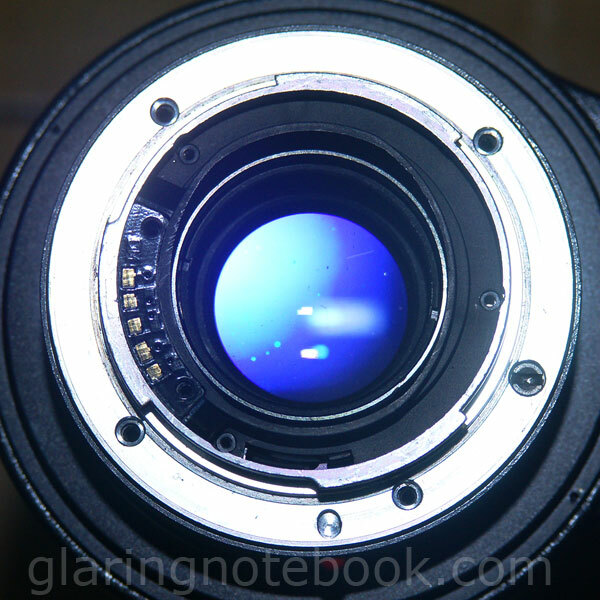 The lens hood is the ALC-SH112. I can’t tell if it’s focus by wire – you can’t even see the focus elements moving if you look at it from the front for the 16mm and 18-55mm even at the 55mm end!There is a delay when turning on the NEX cameras, probably caused by priming the lens aperture – the NEX lenses have their apertures closed when not mounted, or when the camera is off. When you turn it on, it opens slowly, closes again, and then opens again animatedly. You can see the screen brightness animate when this happens. Why does this have to happen, and why do we have to wait for it? One step backward. 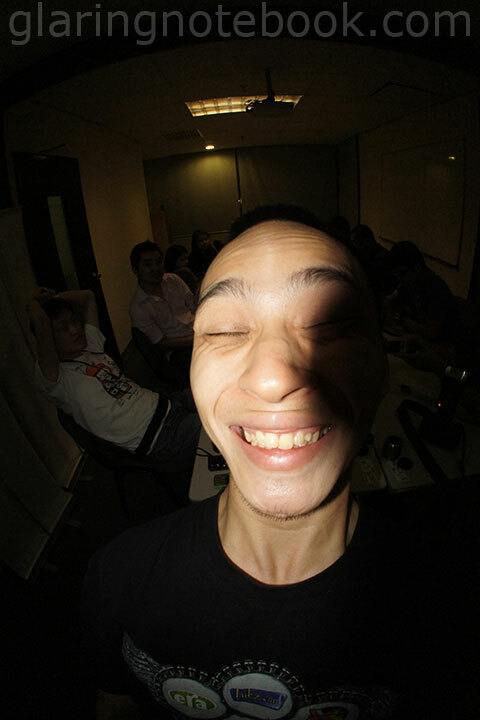 Please pardon this crop from the fisheye converter! The package does not include a body cap, but there is a new rear cap which is gray in color and feels just like the A-mount cap. In front is the plastic case for the HVL-F7S flash. Yes, the flash has its own case! 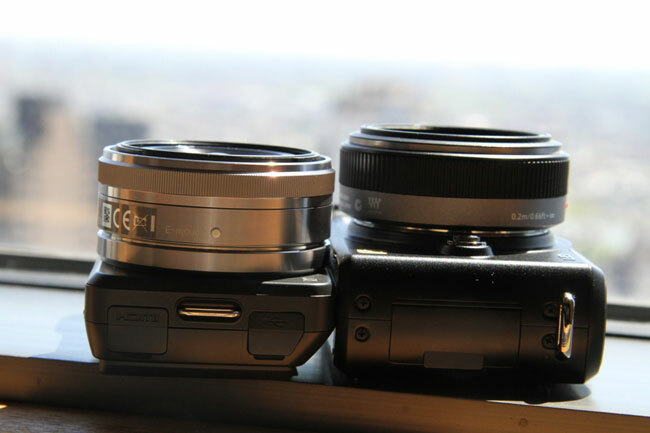 Left to right: Sony Alpha NEX-3; Sony Alpha NEX-5. You open the top by pulling it up with a fingernail. 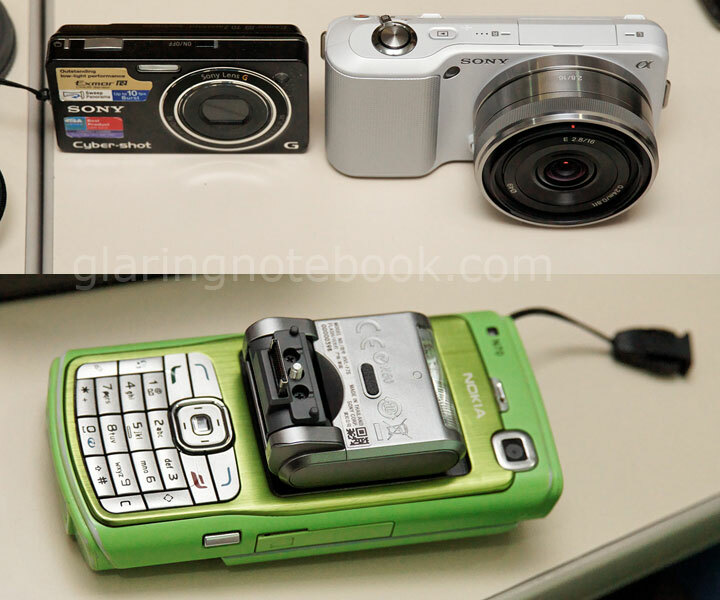 Top: The Sony Cybershot WX-1 on left; Sony Alpha NEX-3 on right with Sony E 16mm F2.8 pancake lens. Every picture you have seen of this camera, makes it look a lot bigger than it really is! I can fit the 16mm and flash on camera, in a loose pocket (not a tight jeans pocket) but with the handle in first. Another picture to show scale. Note the tripod mount adapter for the LA-EA1 A-to-E-mount lens adapter. The external stereo mike has a switch to go between 90 degrees and 120 degrees coverage. Very sweet! I don’t know since I don’t have a professional mike, whether 90 degrees is tight enough. There was also a mock Sony E 18-200mm F3.5-6.3 OSS (Active).Both the NEX-3 and NEX-5 feel surprisingly natural in hand, like the Samsung NX10, GF1 etc. Nothing at all like the A230/A330/A380. The magnesium alloy body of the NEX-5 feels a heck lot more solid than the non-magnesium alloy bodies, which creak when heavy lenses are mounted! It is sized like an 85mm F1.4 but with the hulking look of the Zeiss 16-35mm/24-70mm/135mm. 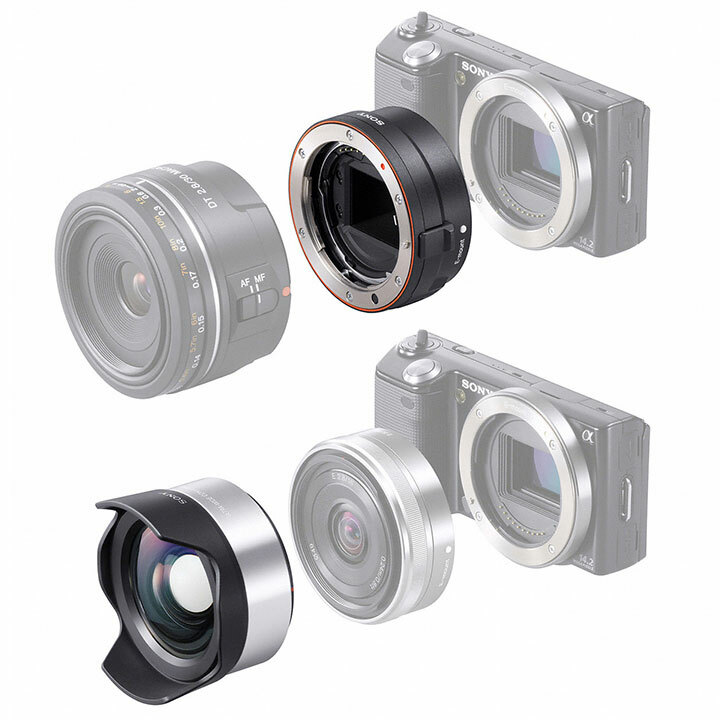 Left: Sony Alpha NEX-5 with LA-EA1 lens adapter; obviously the A-mount is wider than the E-mount, as you can see the Sony E 16mm F2.8 (and VCL-ECF1 fisheye converter) on it. Top-right: The underside of the VCL-ECF1 fisheye converter; it has a bayonet mount and clicks on snugly to the Sony E 16mm F2.8’s bayonet front. I forgot to try putting a 49mm filter on the 16mm to see if the VCL-ECF1 fisheye converter could still mount! Bottom-right: The LA-EA1 lens adapter allows full aperture control but definitely no AF with screw-drive lenses. I did not fully mount it yet hence the rotation. I tried the Sony 30mm F2.8 DT Macro SAM on it, but it jerked a bit and didn’t jerk or move again after pressing the lens release buttons. Then again this was a demo unit so the functionality could be changed, as there are other testimonials saying that SSM lenses did AF. The Minolta 50mm F1.4 balances well. Then again, a Nikkor 50mm F1.8 E-series pancake will fit in pockets better. MF with screw-drive lenses was not as hard as I thought – if you saw the video from the Zeiss 135mm F1.8 the first thing you’d notice is the wobbling (no SteadyShot!) You’d probably think that it supported AF in video, the way I was manually focusing. Anyone could beat the contrast-detect AF speed on say the Nikon D90 easily. Then again, I was pretty alright refocusing with the Nikon D90 albeit handicapped by the reverse focus ring. Unfortunately, the rectangular baffle of the LA-EA1 lens adapter is APS-C sized; if there was a future full-frame NEX body, you’d have to buy a new lens adapter to fit full-frame lenses! 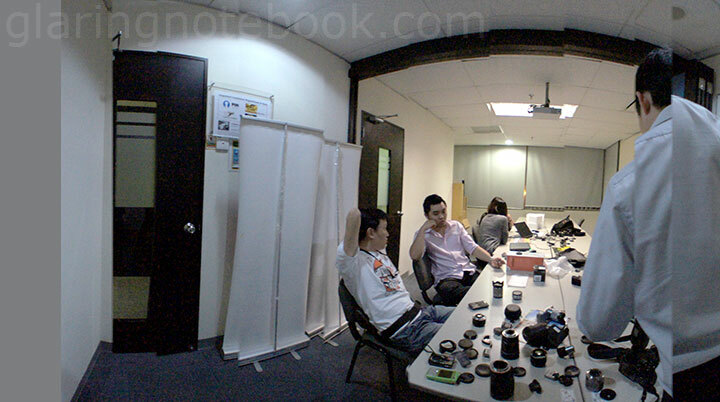 Sweep Panorama with the VCL-ECF1 fisheye adapter isn’t as clean as it is without – it also stops at a 180 degree turn. However it should still, in theory, give you more at the top and bottom. Will need a scientific test with and without for this. Sweep Panorama fires the shutter away, making it a really noisy process – nothing at all like the silent sweeping espionage on my WX-1. One step backward. The fisheye adapter has a permanent lens hood which will reach nearly the center of the image when flash is used. Sony, give us a bigger flash or the ability to trigger an external flash! One step backward. 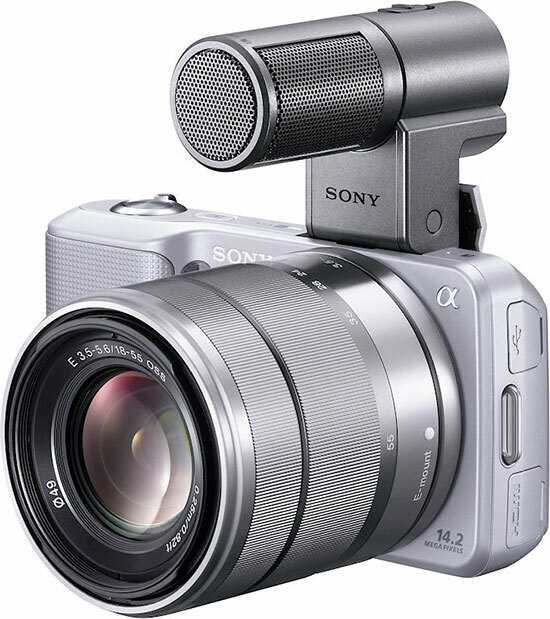 At the very least, I would buy a Sony FA-CC1AM flash cable with the E-mount accessory port instead. 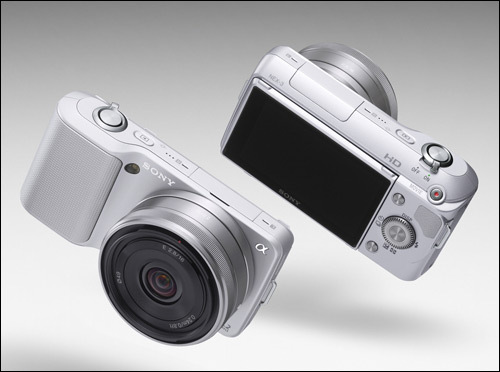 What about Sony Cybershot cameras? If you just changed ISO, and want to change it again, it will remember that you were at the ISO option, so you skip step 2 and save time! There is a lower button which is always set to Shooting Tips. I would love for this button to be customizable, to change ISO, for example. 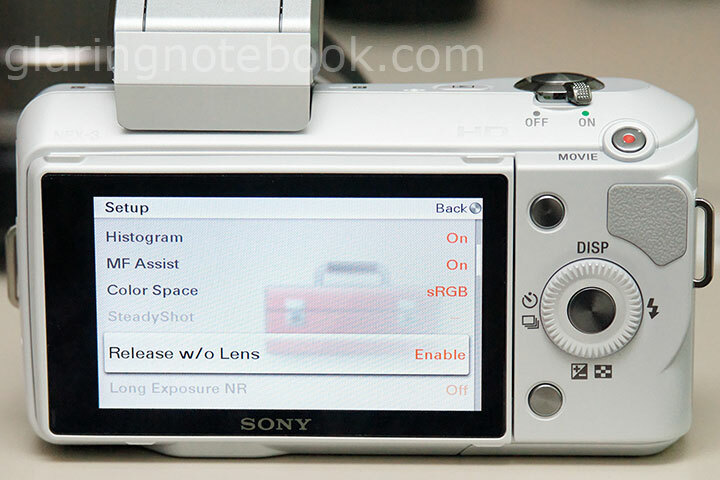 I wish the Sony Cybershot team designed the menus instead! The idea of putting the workload in another team to get to a deadline is cool, but the results were not cool. I’ve always thought that the Cybershots had far better menu design. One very big step backward. Heck, even changing the sweep direction is far more hidden, by these darn Sony Ericsson designers! Don’t get me wrong – I don’t expect the interface of a bigger-sized Alpha 900 with loads of buttons, but this is weaker than the Cybershot interface. That said, if you are interested in the NEX series, or a tiny Mirrorless Interchangeable-Lens Format camera, and you are well aware of its shortcomings, when you see and touch one, you will not be disappointed! A slight desire for this will be amplified when you see it. This entry was posted in Geek, Pictures on May 26, 2010 by 2konbla. Why? 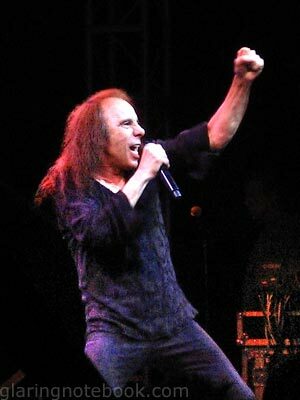 Because Ronnie James Dio, prominent heavy metal vocalist for many bands like Black Sabbath, Rainbow, Dio, passed away on the 16th of May 2010. He is the voice behind Holy Diver and Heaven And Hell, if the only clue you have of good ol’ heavy metal is from classic rock compilation albums. The lineup of Black Sabbath when Ronnie James Dio was in it, returned again under the name Heaven & Hell. They toured to Fort Canning, Singapore, where I managed to catch him! 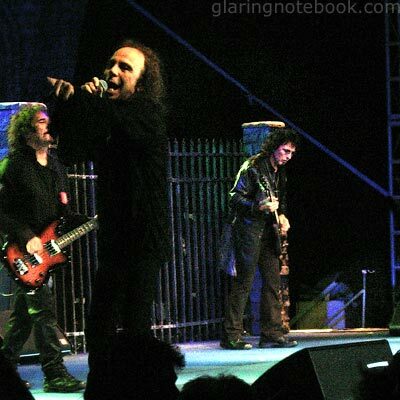 A stage moment with Vinny Appice, Geezer Butler, and the plastic-fingered Tony Iommi as Heaven & Hell, in 2007! This entry was posted in Music, Pictures on May 17, 2010 by 2konbla. 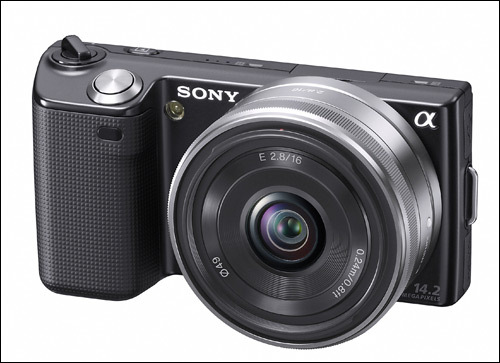 Sony launched the long-awaited Sony Alpha NEX-3 and Sony Alpha NEX-5! They are interchangeable lens cameras with a 14.2 megapixel APS-C sized (23.4×15.6mm) CMOS sensor, capable of recording HD video. Both do not have mirrors, allowing for far more compact sizes! This is the NEX-5. 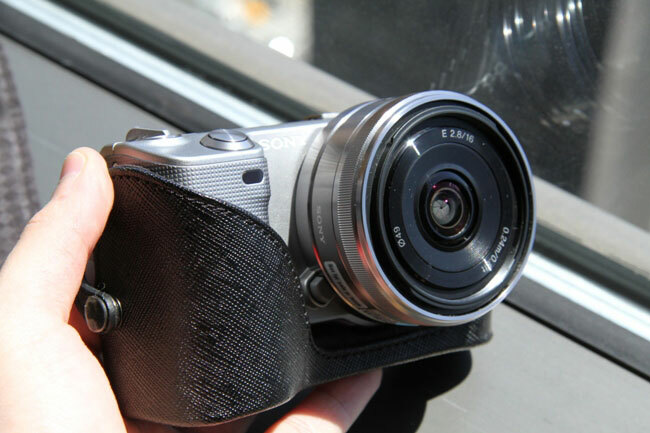 This is the cheaper, polycarbonate-bodied NEX-3 with the Sony E 16mm F2.8 pancake lens. The magnesium alloy-bodied NEX-5 costs a bit more for a smaller figure. 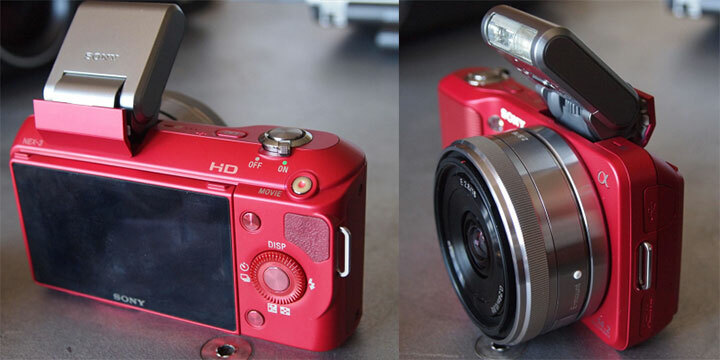 Both NEX-3 and NEX-5 have an excellent TruBlack 3″ 640×480 LED-backlit screen which can swivel up and down! 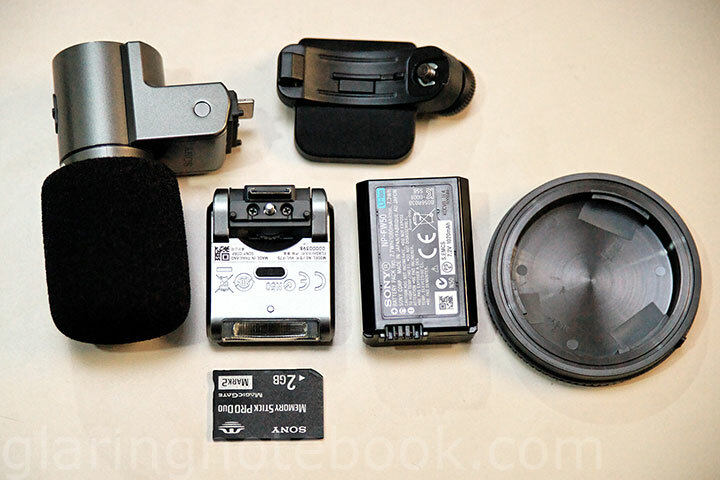 This is the underside of the NEX-5, which is trimmed somewhat around the tripod mount! 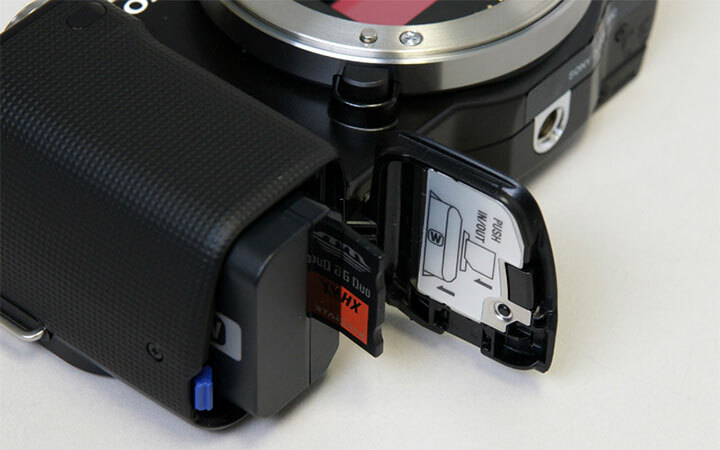 They take a new NP-FW50 battery, and have a single card slot which fits both Memory Stick Duo (MSPD, Pro-HG Duo) and SD format (SD, SDHC, SDXC). 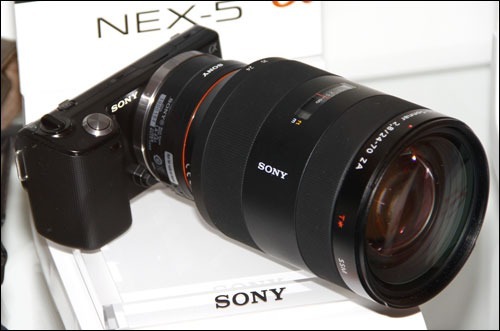 This is the Sony E 18-55mm F3.5-5.6 OSS (Optical Steady Shot) on the NEX-3. 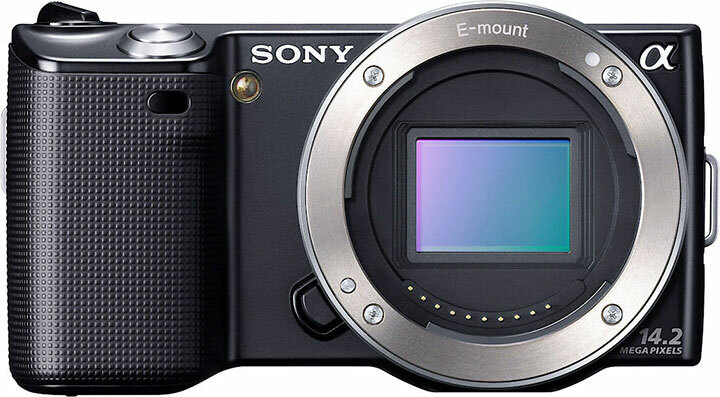 Sony also announced an E-mount camcorder! 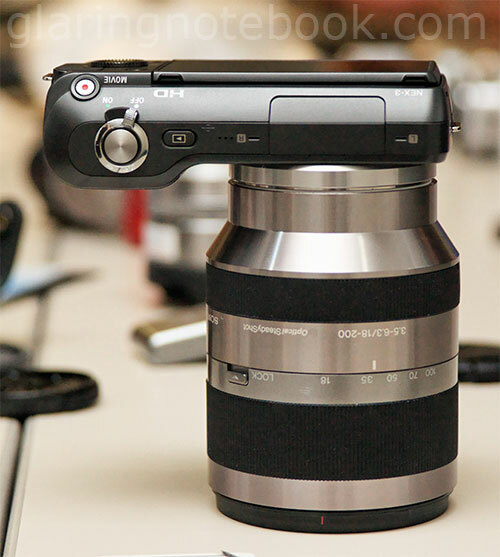 Also in the picture is an upcoming Sony E 18-200mm F3.5-6.3 OSS (with Active mode). 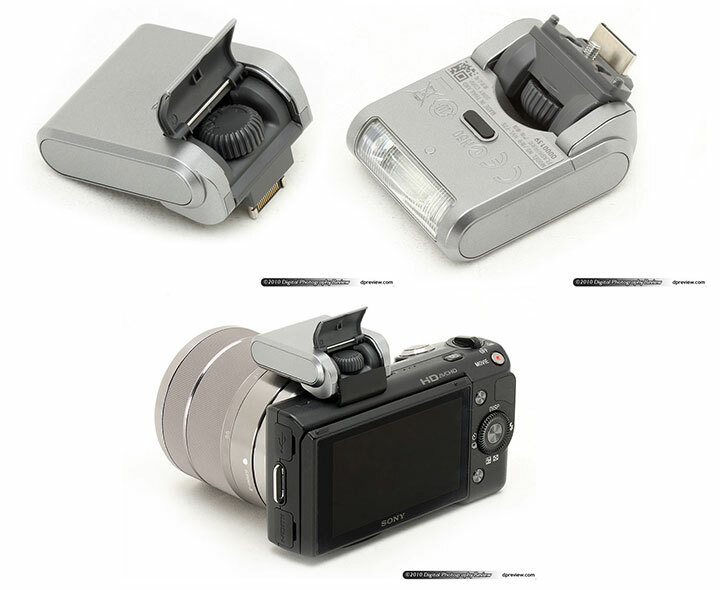 The NEX-3 and NEX-5 do not have a pop-up flash – instead they have a detachable flash which comes with in the box! This is the cute HVL-F7S. 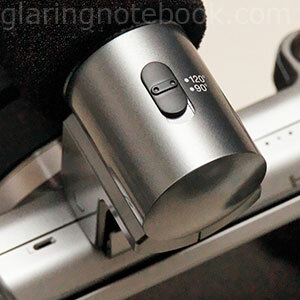 It mounts using a new proprietary connector and screw thread to tighten. Closeups. This flash does a guide number of 7 meters at ISO100. On the red NEX-3. Quite a striking color that one! 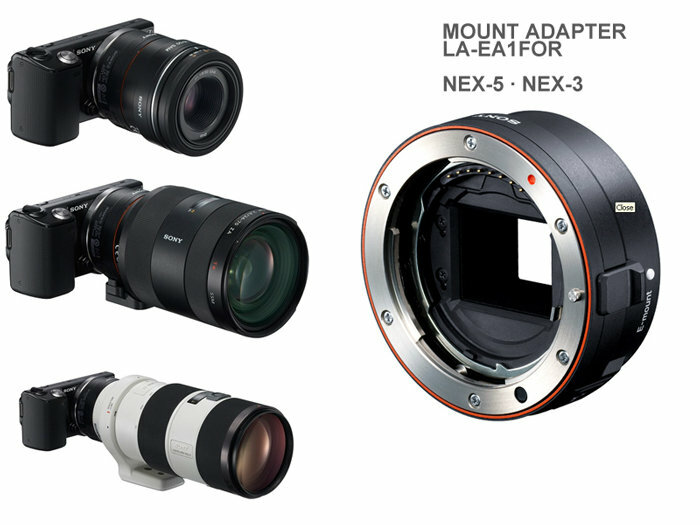 There is a LA-EA1 lens adapter, which lets you use A-mount lenses on the NEX cameras. It has a detachable tripod mount. 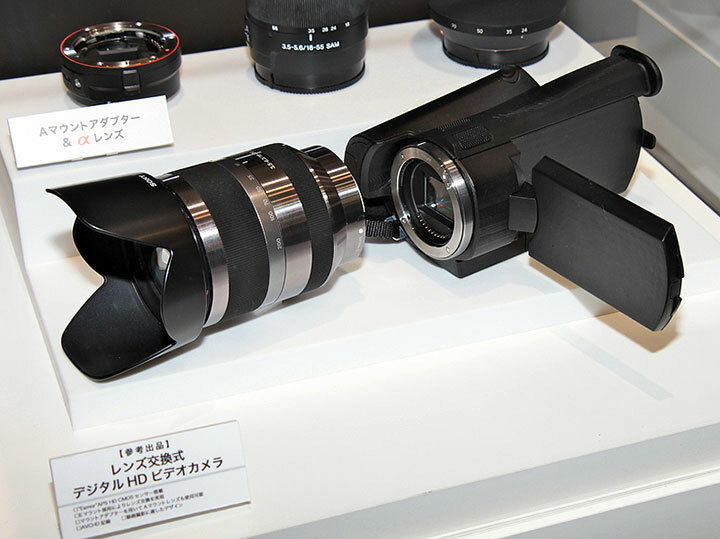 If I could get my hands on one, I could determine if the slot is big enough for a future 36x24mm full-frame NEX! 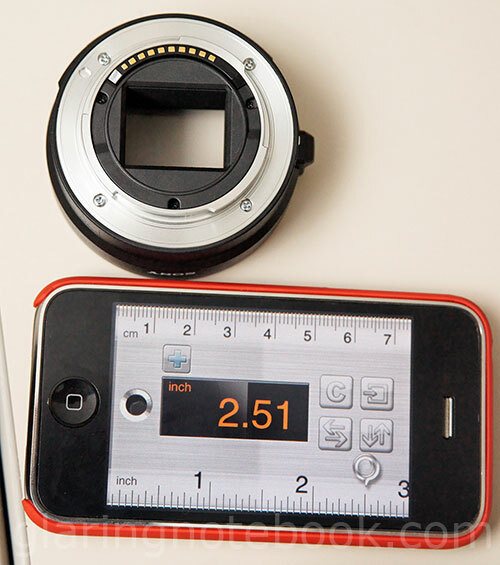 It lets you control aperture, but does not allow autofocus, not even with SSM/SAM lenses, sadly! 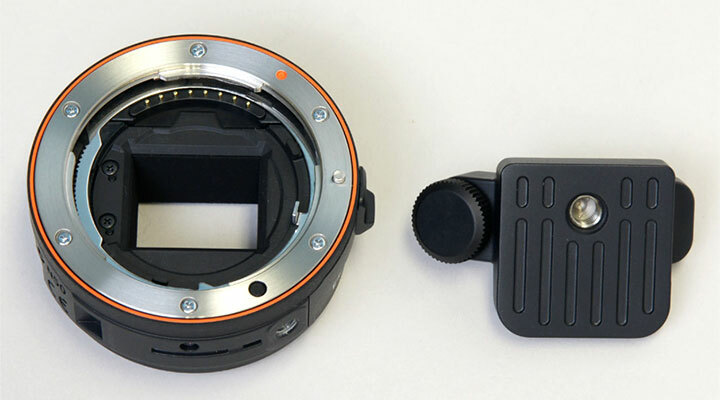 The VCL-ECU1 wide-angle converter (for 18mm on full-frame equivalent) and VCL-ECF1 fisheye converters mount onto the Sony E 16mm F2.8’s front bayonet mount. Oh and there’s Sweep Panorama, which isn’t limited to the 16mm lens. I wonder how the wide-angle and fisheye converters will work with this! 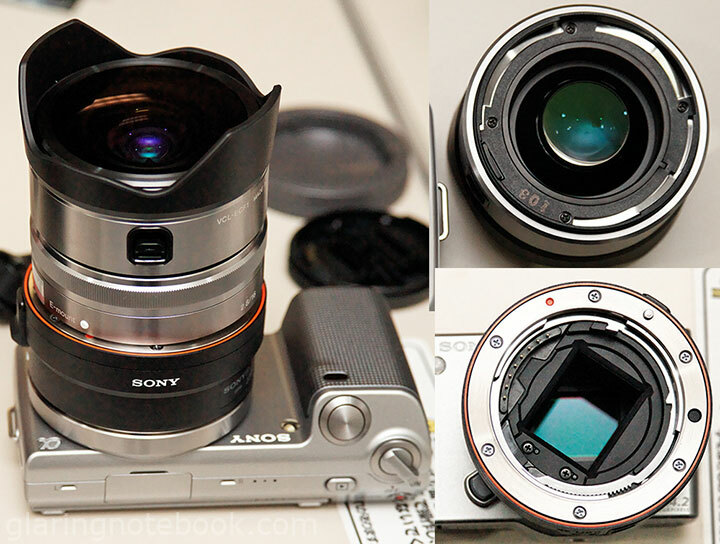 The Sony Carl Zeiss 24-70mm F2.8 SSM mounted on the NEX-5 via LA-EA1 lens adapter. This is the external ECM-SST1 stereo mike. Sony also sells various other accessories, including this LCS-EMB1A/LCS-EMB2A leather case. There is also a lens-covering leather jacket in the LCS-EML1A and LCS-EML2A. Oh and the STP-XH1 strap. There will be a presumably smaller version of the LCS-WR1AM – the LCS-WR2AM wrapping cloth, in black, brown, red and white! There is a FDA-SV1 optical viewfinder which complements the 16mm nicely. So how does it compare to the Panasonic Lumix GF1? Obviously, much smaller! There are complaints about the menu being slow and difficult to maneuver but I’ll wait until I can try one to make any statements. 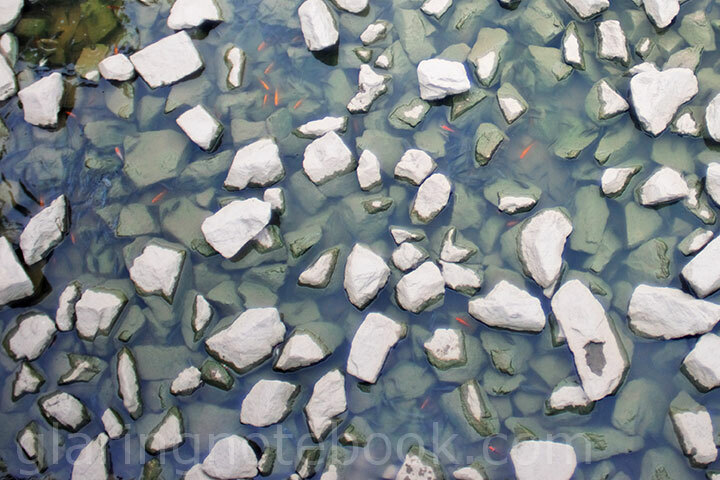 However, the wonderful things are the ISO performance which goes from ISO200 to ISO12800. I’ll wait for DxO Labs to measure the real sensor sensitivity though. Both the NEX-3 and NEX-5 offer 7 FPS in Speed Priority Continuous mode, and 2.7 FPS in Continuous Advance. The flash sync is 1/160th of a second, unfortunately due to a focal plane shutter. There is DMF (Direct Manual Focus) which lets you manual focus after focus is confirmed. There is also Kelvin WB available with M9-G9 color correction! – Sweep Panorama which can go up to 12416 x 1856 Horizontal (Wide) at 226 degrees, or 2160 x 5536 Vertical (Wide) at 151 degrees. Yay the lens release button is on the inside, to make it easy like the K-mount. Woohoo, 18mm flange distance! Hello Noktor 50mm F0.95! 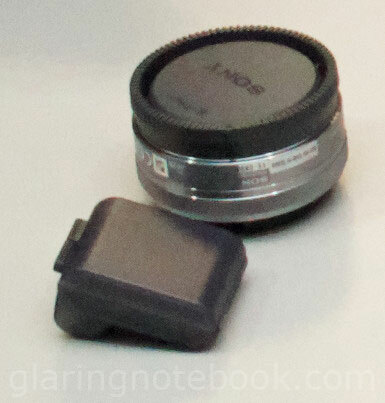 Oh and of course – tilt/shift adapters! You know what would be very fun? Pentax K-mount APS-C pancakes! 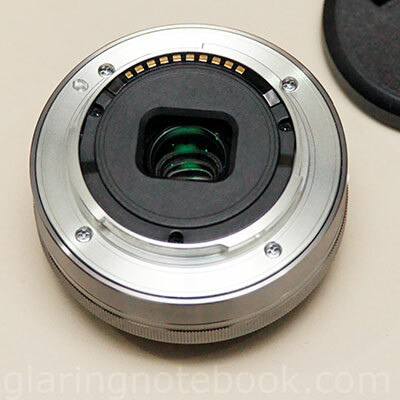 Heck we have 7.5mm of adapter space for the Samsung NX 30mm F2.0. We’ll finally get videos using the 135mm STF! This entry was posted in Geek, Pictures on May 13, 2010 by 2konbla. Some of us with old screw-driven Sigmas, the Sony 18-70mm F3.5-5.6 DT kit lens, and even my Tamron 200-400mm F5.6 LD 75DM, have experienced gear stripping – that is, the internal gear track of the lens has broken, usually a few gear teeth on a plastic track. What does this mean? I’ll open my gear-stripped Tamron 200-400mm to show you! I’ve sent this to repair before, but they said they were out of parts (this is the first generation of this lens, and the second-generation 200-400mm was then made obsolete with the Tamron 200-500mm F5-6.3. The symptom of a gear-stripped lens is simple – mount the lens on camera, turn it on, and the camera will focus the lens to infinity… and it will start vibrating and making a loud whirring sound there. The reason is that the gear cannot catch onto the teeth because it is broken. You can then change your camera to manual focus, and then turn it towards close focus. Auto focus may work, but if you miss and the camera hunts, it will get stuck at infinity and vibrate again. 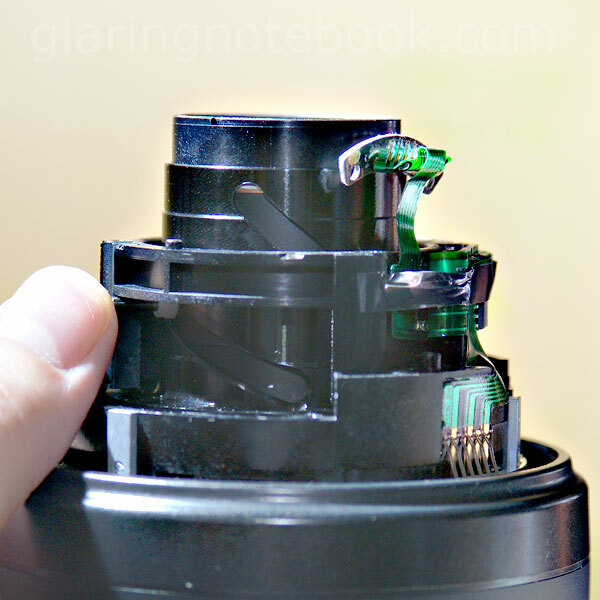 Note that this does not only happen to Alpha-mount lenses – Nikon F-mount lenses can get it too. Also, this was a good reason for Sony to dump the 18-70mm for the Sony 18-55mm F3.5-5.6 DT SAM which has a in-lens motor and would not face this problem. 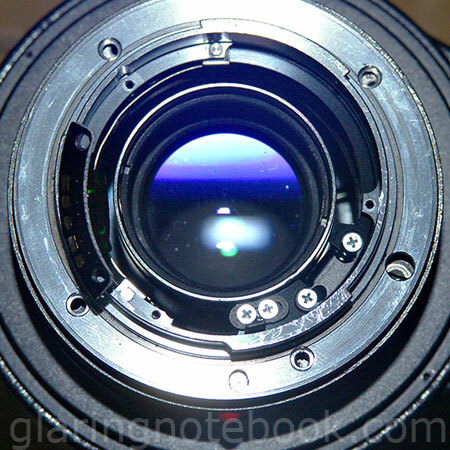 Likewise for the Sigma lenses with HSM – they would not face this problem. Anyway, the A-mount is rather simple from the back – there is a black shield piece (in between the metal mount and the rear optics.) You need to remove this first. Note that the information chip gets in the way – so you gotta pull it aside without breaking it. Here, the black shielding piece is removed. 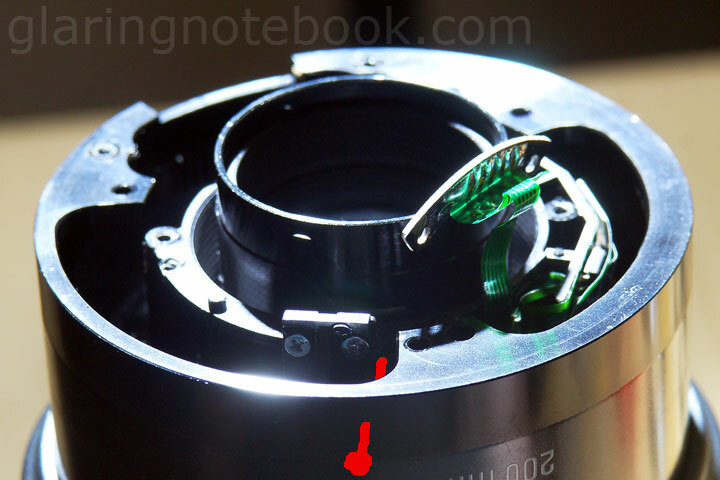 The black-colored metal piece with two silver screws close together, is the aperture lever, and the other black-colored metal piece with two widely spaced silver screws, opens and closes the aperture blades by transferring motion to the aperture pin. 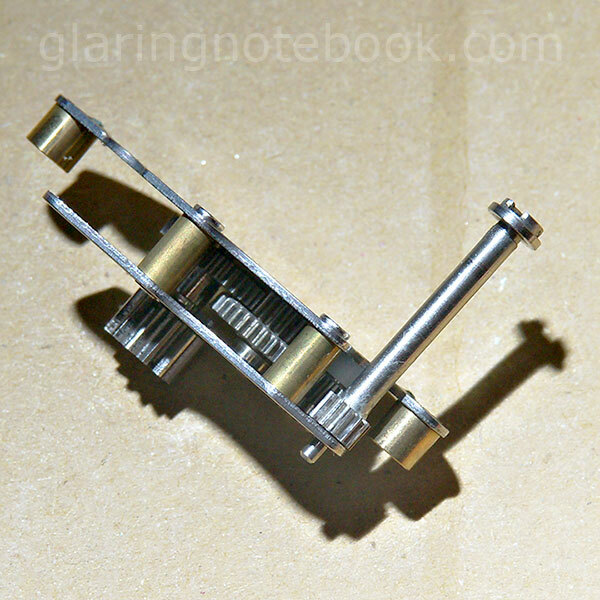 After removing the metal mount, I could remove the gears – here, it changes the gear ratio to a much slower one. Note the large gear in the bottom-right – this is in contact with the gear track. The screw drive of the camera connects to the shaft in the top-right. All metal. I then removed the rear lens collar bit, and viola! Here’s the broken gear track. The broken teeth are in the top-right corner. 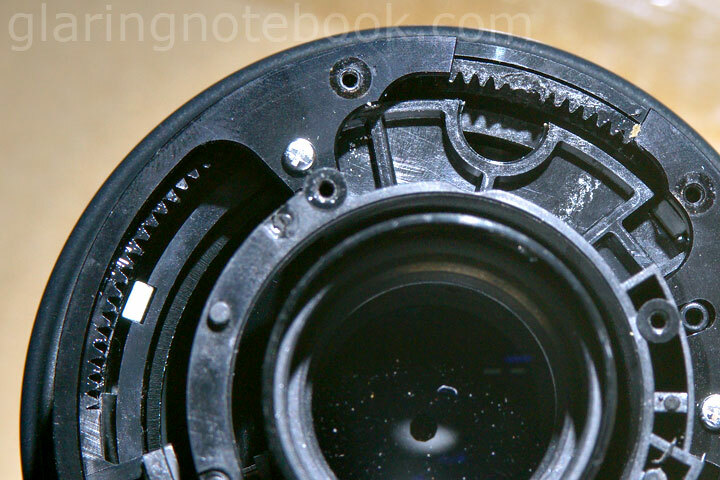 The hole is where the aforementioned large gear transfers rotation to the lens. In theory, I could drive a nail down where I have marked it in red, to prevent the lens from getting to infinity (and thus getting stuck on the broken gear teeth.) However, my later pictures will show you why it can’t be done. 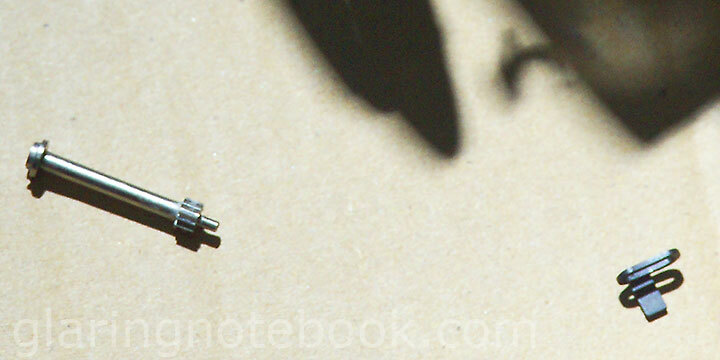 The screw drive shaft, and the aperture uh… pin. 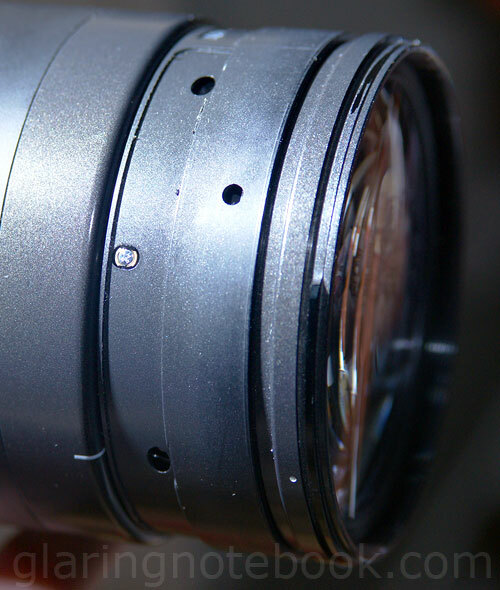 I then removed the outer part, with the focal lengths marked. As it turns out, the gear track is on that big long plastic tube in the top-left! 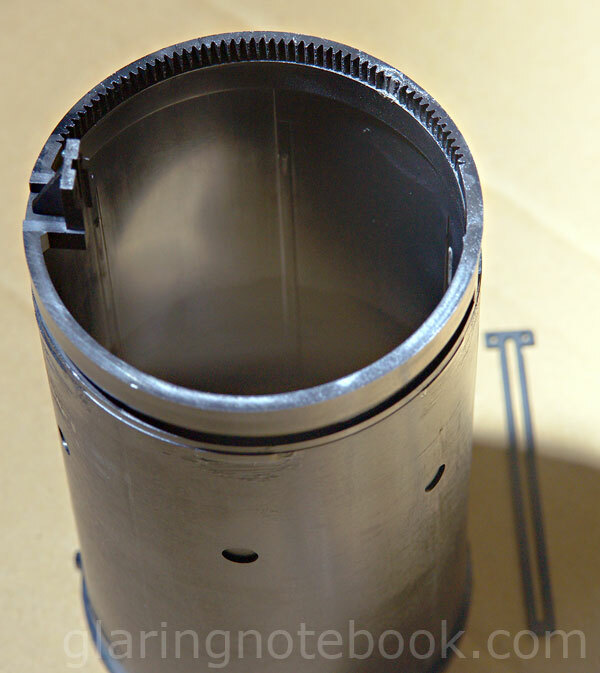 I removed the big long plastic tube with the gear track. This is almost as long as the lens, when retracted! No wonder the gear track is not made of metal – if it was, it would make the lens a lot heavier, and the focusing would be slower due to the weight. Slightly out of focus, and to the right, is a rod that grabs onto a pin that pulls the focusing group nearer or further, to focus. My thumb is holding that pin. Here it is at minimum focus distance. If I let go, it will roll down, and focus on infinity. Fully extended. The gold-plated track tells the chip what the focal length is. 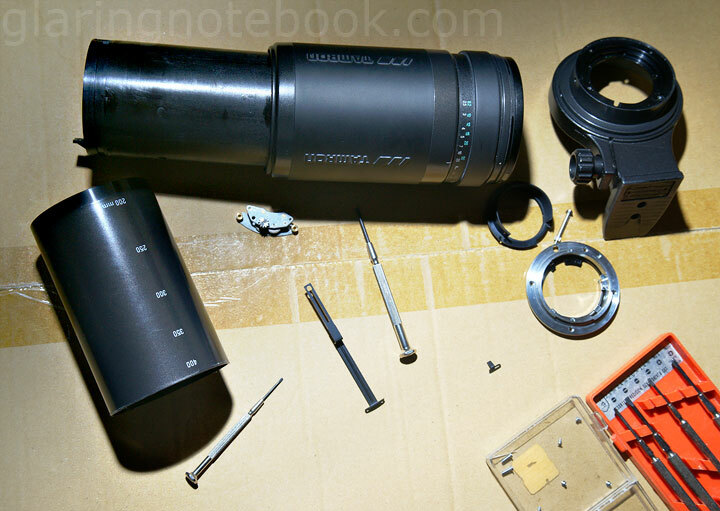 My initial plan was to stop the lens from going to infinity, but seeing how it wasn’t possible (the focus ring would’ve been my last hope) I ended up reassembling the lens but leaving the screw drive shaft out. So there is a hole where the screw drive used to be, and the camera will try to spin its screw in there if in AF. Focus confirm, autoexposure and SteadyShot work fine. I just have to manually focus, but at least it doesn’t have the annoying gear-stripped symptoms. 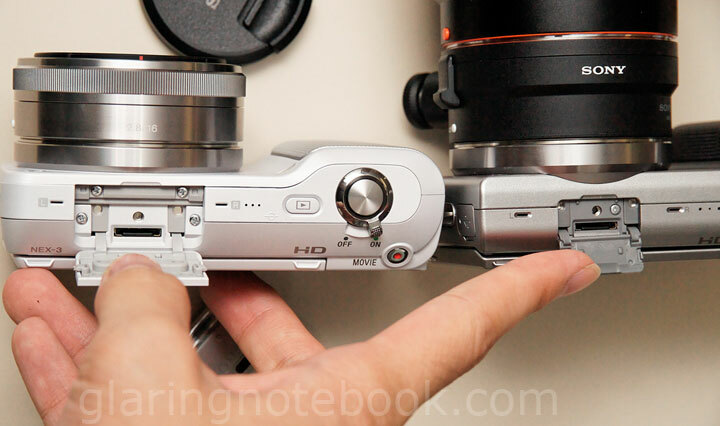 Also, since there is no screw drive, manual focus is very, very smooth! This entry was posted in Geek, Pictures on May 9, 2010 by 2konbla.